This article was originally posted by Neil MacQueen for rotation.org. It has been updated with additional ideas and observations gleaned from member comments. Though originally a model implemented by mid-to-large size churches, thousands of smaller churches have proven the scalability of Rotation Model concepts and practices. The Workshop Rotation Model can easily be adapted in small churches that have few students, or few classes, or little space. Small churches adopt or adapt the WoRM for the same reasons as larger churches, with "attracting families" an even more important need. "Small" and "few," of course, are relative terms. Some "small" congregations have lots of kids, and some big congregations have very few kids. To some, 20 kids is "small," where as, that's what some churches aspire to! So for our purposes here, I am defining "small" as fewer than 15 regularly attending elementary age children. The optimal class size for one Sunday School teacher is arguably about six children of similar age. Larger class sizes or numbers of classes/workshops are easier to scale up to in Rotation because they simply require more helpers, materials, and space. Furthermore, it's pretty easy to figure out a schedule of workshops if you have two or more age groups/classes. Six kids works well for discussion, drama, art supplies, etc. Any fewer than six, and you'll inevitably have Sundays with only 2 or 3, and sometimes dramas and games are better with more. Where it gets challenging is IF you only have ONE class of 4 to 5 children with a wide age range, or TWO classes with fewer than 4 regular attenders in each. And this is exactly what defines some "small" churches. If you have just one or two classes that have small numbers, seasonal and family attendance fluctuations can leave you with some Sundays that have just 1 or 2 kids, or sometimes NO kids in a particular class. Such fluctuations tend to bother the teachers more than the kids because they've prepared. See some of the tips below for how to go with that flow! I'm often asked, "should we split our 3 younger from our 2 older elementary age kids?" I tell folks that the answer is entirely dependent on the kids themselves, the attendance patterns, and your church's ability to handle two classes instead of one. IN GENERAL, I prefer maintaining a CRITICAL MASS of kids per class so that we have a sense of "group." It is easier to teach 5 kids of various ages, than to split into two and hope every kid will be there each week for the lessons we have prepared just for them. Below is some more advice. "Workshop" refers to the way you teach, and not necessarily to "how many rooms" you have. I can do four different workshops in the same room if I needed to. Not preferred, but could. Any space can be designated a "workshop." Any classroom can be converted into a unique workshop space. It's just a lot EASIER if you have different spaces you can leave SET UP from week to week. Leaving a room set up to teach drama, or with computers or using art—is one of the "GREAT INNOVATIONS & PLANNING RELIEFS" that Rotation Model brings to any size Sunday School. "Workshops" are as much for the creative teacher as the kids. "Rotation" refers to the way individual students need to learn, REGARDLESS of how many students are in a class. Students need to learn same story over a period of weeks through different media. That's non-negotiable. So it doesn't matter if you have 3 kids or 30—they each need to learn the story through several different learning approaches. Small Church Rotation Models still "rotate in" different teachers each week to lead the workshop. I consider this rather non-negotiable as well. In order for teachers to maintain creativity and prepare truly creative workshop lessons, we can't burn them out by changing the lesson on them every week. Thus, in a small church, if you have a four week rotation on Jonah, for example, you might have 2 teachers each take 2 weeks of the rotation. I might do Art and Drama, and you might take Video and Computer. Depends on how many teachers you want to involve. Or you can have 4 different lead teachers, and 1 shepherd who stays the same each week. Depends on how many adults you have in your small program. Gonna say it again: One teacher trying to teach one story through a different medium/workshop each week will eventually wear out that teacher. They'll keep teaching, but their workshop lessons will become less creative over time. It's not uncommon for small Sunday Schools to be run by two teachers who split up the workshops. Those teachers need to bring in special helpers (teens and other adults) to stay creative. They should also plan breaks in their schedule. Four weeks per story is still considered a "minimum" number of weeks for most stories/passages regardless of the size of your program. Small churches usually have BROADLY GRADED classes. Any model, including the Rotation Model, will find it challenging to come up with a lesson that works for BOTH a 1st and 5th grader sharing the same class. It gets a little more complicated depending on the age distribution of your church's particular students. Take for example the church that has one kindergartner, two third graders and one seventh grader. I would turn that seventh grader into a teaching assistant and have them help me with the 3 younger kids. In some workshops, I would ask them to be the Kindergartner's "buddy" to help them with reading and following instructions. Your solution should depend on who your kids are, their capabilities, talents, and attendance. Don't give up and don't "go back to boring." You want the kids you DO have to love learning God's Word, improve their attendance, and attract new attenders. As mentioned above, most groups work best when you have a sense of "critical mass." The difference between 2 kids and 4 kids in a class is dramatic. Not only does it feel better to the kids, the level of energy and activity is different, and what you can DO is different. So....If you only have 2 or 3 kids, invite some teens or older adults to form an intergenerational class with the kids. You might just get much more than you hoped for! Older kids, especially, don't like to be "one of the few" as they equate number with "cool." Inviting a Jr. High or grandparent, pastor or parent on a regular basis can help the kids feel like they are part of a community. You can also gain extra students by asking couples and entire families to "teach a workshop together." Plan special workshops and activities that INVITE the friends of your children. For example, encourage the younger kids to have a friend sleepover the night before and bring them to a special Breakfast Cooking Workshop or Seder Meal. Promote, promote, promote. Tell your story. Always ask grandparents to bring their grandkids. Always welcome friends and make sure you send something home about your program. Begin to view "few" kids as a special opportunity to do some special things for those kids! Never make "the few" feel like "not enough." 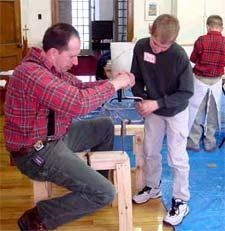 For example, many churches with large classes might never attempt a "carpentry" project because of the tool and material requirements, but with just 2 students, you can have an AWESOME hands-on carpentry workshop led by a woodworker in your congregation who wouldn't otherwise teach. If you have just three or four students, and sometimes only ONE or TWO of them shows up, having a computer laptop ready with some Bible game software, or a special service project ready to go—is a great way to shift gears and save the full workshop lesson for the next Sunday. 1. Definitely schedule a Cooking Workshop so your church kitchen can be one of your workshops. 2. Drama and Games and Video do well in OPEN spaces, or using the same room. To set up your space or room for video, bring in stackable adirondack chairs or director's chairs that can be removed for the Game Workshop next week. Hang Drama workshop costumes and on the wall or in a cabinet to clear floor space. Have a taut wire across the ceiling to hang a fun curtain on Drama Workshop week. 3. Set up an outdoor space or a tent at the end of a low-traffic hallway. 4. Use laptops, instead of desktops, so your computers dont' take up space in your classroom that needs to be used differently the following week. 5. Come up with creative and QUICK WAYS to transform your single room every week into a new space. 6. Look for other types of space if you don't have enough classrooms. I've heard of computers and drama spaces set up at the end of hallways, games in parking lots, and videos shown in the Pastor's Cindy's Cinema (which she taught once a month in her office). Our SHARED SPACE ARTICLE has many great ideas. See the posts below for more GREAT IDEAS for SMALL WoRMS! Your replies and suggestions welcome. Some workshops, such as, the Bible Games and Drama workshops, can be harder with small numbers unless you are careful about the KINDS of games or dramas you use. Big group games need to be reformatted. Kids can play multiple roles in dramas. Whereas, other workshops, like art, computers and cooking are EASY with small numbers, and where attendance varies unpredictably. Some workshops or styles of lessons that involve more READING and comprehension are harder in small churches where the age range might be BROADER. Take a close look at your lessons and look for ways to make sure your younger kids aren't ignored or lost, and your lessons aren't "beneath" your older kids in a broadly graded situation. In many small churches, teachers have to teach more than ONE workshop. It's a good idea to have them teach back to back weeks in the rotation so that they maintain some continuity. In churches with just one or two rotating classes, but a larger number of rooms (as is sometimes the case in an older/larger facility), it's a good idea to put out a SIGN in the hallway to tell parents where their kids' class is that week. It may be harder in a small church to be as creative as the Rotation Model wants to be (because you have fewer people helping), so look for EASY creativity, as opposed to complex. For example, don't burn volunteer time on painting extensive "Bible" murals, instead, bring in creative props, such as, a beach or camp theme. Use the Writing Team's lessons, instead of writing your own, or cobbling together lessons from incomplete posts found elsewhere. Purchased Rotation curriculum all seems to be written for class sizes of 5+ kids. Don't SKIMP ! You want more kids. Definitely do not get discouraged. When I started rotation, I sometimes had only 3 children there and I do multi-age, so this was all the children there in total, not just in one group. I stuck with it because I believed in it. After one year, we average 15 kids every sunday. Rotation works, kids will begin to tell friends and it will become contagious. I have kids that set their alarm clocks and wake their parents up because they don't want to miss Sunday School. Hang in there!!! Yes we can! We started our rotation out with 3 children. The kid's had a blast then and after 5 years they still coming are along with the 37 children which have joined us since starting rotation! Note your PEAK attendance times of the year and roll out your "big" rotations then. Plan for easier or less-attendance dependent activities during your LOW times of the year. Because Week to Week Attendance can FLUCTUATE greatly in small churches, recruit an extra helper to show up and "check in" at the beginning of every workshop to see if extra help is needed. Treat your older students like helpers so they don't feel like they're being treated like one of the "little kids". Give them special roles and tasks. "Graduate" them to "Guide" status or the like, while they continue to help in the classroom. Give them visible roles. Here's one of the BIG ADVANTAGES of doing the Rotation Model in smaller churches that have broadly graded classed: ACTIVE creative approaches AGE ADJUST easier than typical sedentary "worksheet centered" curriculum. Cooking and Art, for example, tend to age adjust all on their own. On those Sundays when FEW children attend, pull out something really special to do or snack on. Kids are aware of "where is everybody?" so don't reinforce that feeling. Instead, make them glad they were the only ones there. Always have a back-up workshop or lesson plan for those weeks when your attendance is problematic. The computer workshop is our kids favorite "let's play!" workshop (though they are really learning, just don't tell them!). Some Sundays, we'll ditch the lesson plan and go help set up communion. One Sunday we got a tour of the organ and the kids were allowed to play it. They loved that. Have a few of these "emergency plan" activities pre-planned and ready so it's no surprise to the organist or pastor. This also keeps the kids from thinking that the "big game workshop with only 2 of us" was a bust! In the above schedule, we were able to show the same video to both groups because the video worked for both age groups. It's a good example of how the particular RESOURCE you want to use might affect your schedule. The above schedule assumes you have two classes and two different spaces you can use each week. The "Art" or Computer Workshop space could be converted to the DRAMA workshop for week 4 and 5, and the Cooking Workshop could move to the church kitchen. A Note about the Cooking Workshop, ...combining then splitting in a Workshop. Cooking Workshops are easier to pull-off with smaller groups than larger ones. This makes them a natural regular workshop in small churches, because even most small churches have kitchens. And it tends to be easier to combine age groups into one group for Cooking than it is for computer or drama, for example, because of the medium of food prep is less age specific. You might share the kitchen but still split into different discussion groups based on age. The same can be done with Video IF the video is appropriate to show to both young and older, and then split the two groups when following up on the video in discussion. This is harder to do with games, software, and drama. If we were only doing a FOUR WEEK Rotation, we might CUT the Drama Workshop for the older kids and send BOTH classes to the Cooking Workshop in the church kitchen on Week 4. It depends on the lesson ideas you have, your kids and your space. Of course, you can substitute in any other workshop for those listed in the examples. Science for Drama, Games for Computer, etc. Rotation Modelers love this kind of freedom to adapt to available space, resources, age ranges, and workshops ideas.